Prototype: Multi purpose locomotive class 185.2 of Deutsche Bahn AG (DB AG). Use for the Rail Freight Railion Germany / DB Logistics. Two system locomotive built by Bombardier as a standard locomotive from the TRAXX model range. Snowy execution. Operating condition in winter. Model: Metal design with many integrated details. With digital decoder and special motor. 4 axles driven by gimbal. Traction tires. Depending on the direction of travel, the three-light peak signal operates conventionally, can be switched digitally. Lighting with maintenance-free LEDs. 2 mechanically functioning roof pantographs. Snowy execution. Length over buffer 21.7 cm. Electric locomotives The two locomotive series 185.2 of DB AG and 482 of SBB Cargo originate from Bombardier's TRAXX (Transnational Railway Applications with extreme flexibility) family. These locomotives stand for, even cross-border, medium-sized passenger and freight traffic. Modified provisions forced Bombardier from 2005 to adapt the locomotives: the machines received a crash-optimized locomotive box, which makes the locomotives over the previous series look bulliger and powerful. Other changes relate to the electrical converter system, but optically does not matter. 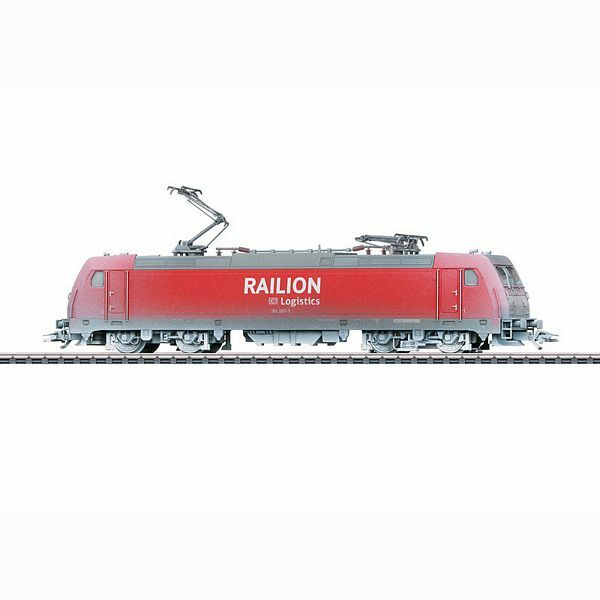 Other rail companies also use the innovative locomotives, since innovative "package" solutions make it possible to satisfy individual wishes and requirements relatively easily. Three-light peak signal alternating with the direction of travel.